I’ve done it. You’ve probably done it as well. At one point or another, most cigar and wine enthusiasts have gotten a little carried away with their flavor descriptors. The aroma of a premium cigar or the bouquet of good wine cries out for comparison to the other fragrances we encounter in our daily lives, but the subjective nature of this comparison often mystifies those who are less sensitive to the subtleties involved. So we take the occasional lump for detecting notes of caramelized sugar or violets or vanilla beans in our stogies. Everyone will acknowledge that taste is subjective, and the fact that you smell cedar where I detect mint does not mean that either of us has faulty olfactory organs — but few cigar smokers recognize the physical reality, the purely chemical nature of the combustion taking place beneath their noses. To some extent this process has been studied, and this series of occasional articles will attempt to shed some light on it. But first, a caveat. I am not a scientist, and I am certainly not a chemist. All I’ve done here is layman’s level research, and I can’t pretend to understand the chemistry in detail. If I mislead or mistate something, I hope someone with expertise will correct me, and accept my thanks for doing so. 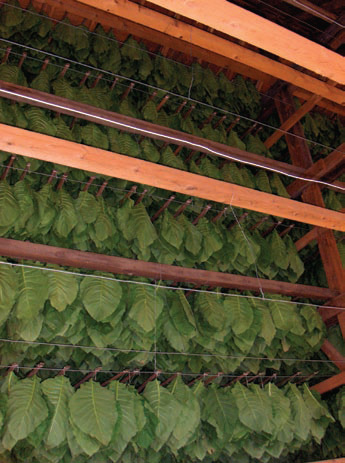 Much of the aroma and flavor of cigar tobacco arises from careful curing and fermentation. As the leaves dry and undergo a natural but controlled process of degradation, chemical compounds break down and create other compounds. Many of these compounds are responsible for the flavor and aroma of cigar tobacco. Leaves from different stalk levels vary in their chemical properties — the highest leaves on the plant (ligero) have higher nicotine levels, tannins and resins. As most of us have experienced at one time or another, a ligero-heavy cigar is frequently powerful and highly aromatic, but doesn’t burn very well . 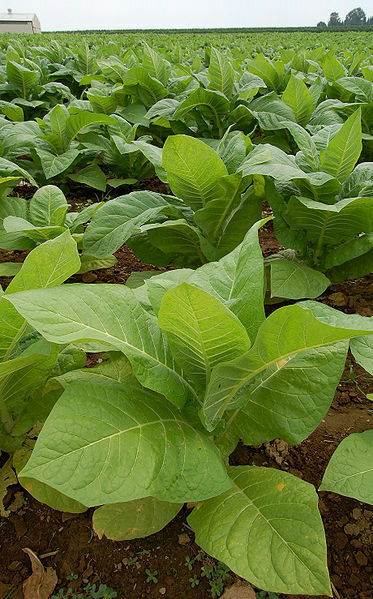 Middle and lower leaves (seco and volado) tend to have lower levels of nicotine, less resins, higher soluble ash, and better burning properties. The importance of careful blending of leaves from different parts of the plant is easy to see here. 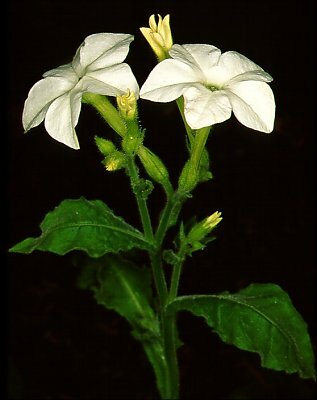 In general, the strength of a cigar tobacco leaf is associated with nitrogen compounds. Aromaticity is thought to come from tannins and resins. Sugars and starches are are associated with mildness. Oxidation is the primary activity occuring in the pilones during fermentation, and this is chiefly responsible for the flavor and aroma of cigar tobacco. During this process the cured tobacco releases carbon dioxide and significant quantities of ammonia. Carbohydrates, which account for 40 to 50% of tobacco weight. These include starches and sugars, sugar esters, cellulose, and pectin. Carboxylic Acids. Cigar tobacco is particularly high in citric and malic acids. Inorganics like calcium, magnesium, and potassium. These affect burning and ash-holding characteristics. In future articles I will be looking at the compounds most responsible for taste and aroma, the isoprenoids and phenolics. And if I can pin down the compound responsible for that elusive vanilla note, I will be sure to let you know. Overall, I think you do a fantastic job of describing that flavors that you experience and I did enjoy reading today’s article pertaining to tobacco. C.A. magazine really take liberty with the American language and some of their decriptions I are pretty outlandish. So pat yourself on the back for a job well done. That was an awesome job, its a field of new information to me. Well done and hope you enjoy your cigars again!!! Thanks guys. I was hoping to get a cigar review up next week, but I’m still trying to kick this cold. So maybe next week we’ll get to learn something about carotenoids instead! Great job with this post and series idea. I caught some serious hell on another cigar review site for calling out someone for using one of Marvin Shanken’s favorite descriptors…pencil shavings. I don’t know about you, but I don’t see how one associates cigar smoke with a Faber Castell No. 2. Maybe your research will help shed some light on this matter. I don’t know about Faber, but I’ve definitely tasted Ticonderoga. But then Marvin smokes those “fancy” cigars. Thanks – useful AND entertaining. Have you wrote the other article? also, is it possible the vanilla flavors are coumarins. Very good article!! I love you honesty on you credentials.